Folks, that is NOT from a BioShock video game! Harrison Krix out of Atlanta built that unbelievably sweet Big Daddy costume, then contacted reps with the Georgia Aquarium and got some time scheduled there for a photoshoot. 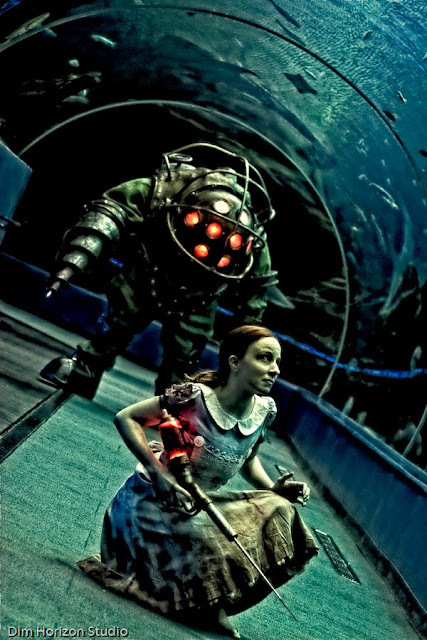 With Harrison in his Big Daddy gear and his fiancée in decrepit dress and scary makeup as a Little Sister, they brought Rapture to life amid real sharks and jellyfish. That is just frickin' AWESOME! Good job Harrison! I am impressed to know that there are Christian cosplayers in North Carolina. I wasn't even sure there were cosplayers (period) in North Carolina!